Exotic is anything you don’t have. And that was once the status of mangoes. But now they crowd peaches, plums, and other summer fruits in the fresh produce section of most markets. During peak season, summer, mangoes are as moderately priced as they’ll ever be ― inexpensive enough to use casually, as in this quick supper dish. I came across it in a little Indian restaurant on the outskirts of San Diego. For all its complex flavors, the dish is surprisingly easy to make. 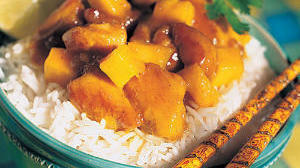 Major Grey, just one of the multitude of chutney mixtures used in Indian cuisine, is an English-influenced version of mango chutney, and it accentuates the fruity flavor of the fresh mango.